Ages 12 through 17. 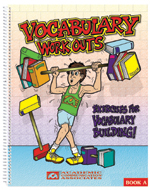 Provide your students with a "vocabulary workout" as they learn new words and strengthen verbal reasoning skills. Each lesson begins with a short story that is presented orally. Ten vocabulary words are introduced in each story. Stories related to a variety of problems commonly encountered by adolescents are included. Skills emphasized include defining words, using context to identify word meanings, comparing word meanings, using synonyms and antonyms, identifying the grammatical function of words, and answering questions using new words. The book can be used to teach new vocabulary and to help students develop thinking skills that are critical for success in problem-solving situations. The activities are especially appropriate for students with language disorders and learning disabilities. Vocabulary Warm-Up Exercises. The student is asked to match each target word with its meaning. Sentence Tune Ups. The student is presented with a target word and with a sentence that does not include the target word. The student must revise the sentence so that it includes the target word. Vocabulary Fitness Training. The student is asked to define each target word and to use it in an original sentence. Vocabulary Workout. The student is asked to match target words with synonyms, to finish incomplete sentences using the appropriate word, and to perform other tasks that strengthen knowledge of word relationships. Grammar Shape-Up. The student is asked to determine whether each target word is a noun, verb, adjective, or adverb. Students are also asked to create sentences in which specific parts of speech are used. Thinking Marathon. The student is asked to respond to questions that include one or more target vocabulary words. The student must include the target word in his/her response. As students respond to the questions, they talk about topics that are relevant to their experiences. A downloadable edition of this book is also available (see RELATED PRODUCT link below).